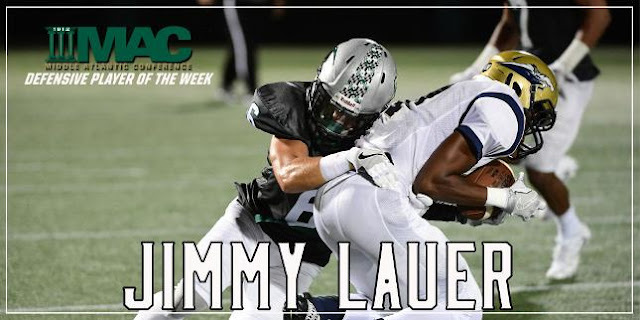 ANNVILLE, Pa. – Stevenson University defensive back Jimmy Lauer was named the Middle Atlantic Conference football Defensive Player of the Week on Sunday morning following his role in the Mustangs' 24-13 win over Lebanon Valley College on Saturday. It marks the second time in his career Lauer has won the award, and a Stevenson player takes home the honor for the second straight week, as senior Austin Tennesseewas last week's recipient. Lauer finished with nine tackles (six solo), including four in the fourth quarter, and an interception in Saturday's victory that moved the 24th-ranked Mustangs to 3-0 and 2-0 in MAC play. The third-quarter interception, in LVC territory, set up Stevenson's third touchdown of the afternoon that gave the hosts a 21-0 lead. In three games this season, Lauer has totaled 18 tackles (12 solo) and a pair of interceptions. Stevenson returns to action Saturday when it hosts FDU-Florham in a 1:00 Middle Atlantic Conference contest at Mustang Stadium.